Yesterday's "Signing of the Stars" was everything Jim Harbaugh is...an honest reflection of what makes him so unique. At times, it was strange, a little confusing, but definitely interesting and impossible to ignore. And in the insane business of wooing 17 year olds to come play football for you, you could argue no one has done it better...or at least...done it with as much enthusiasm as Jim Harbaugh. "Jim Harbaugh doesn't want to go back to recruiting" was what every NFL insider told us 14 months ago. 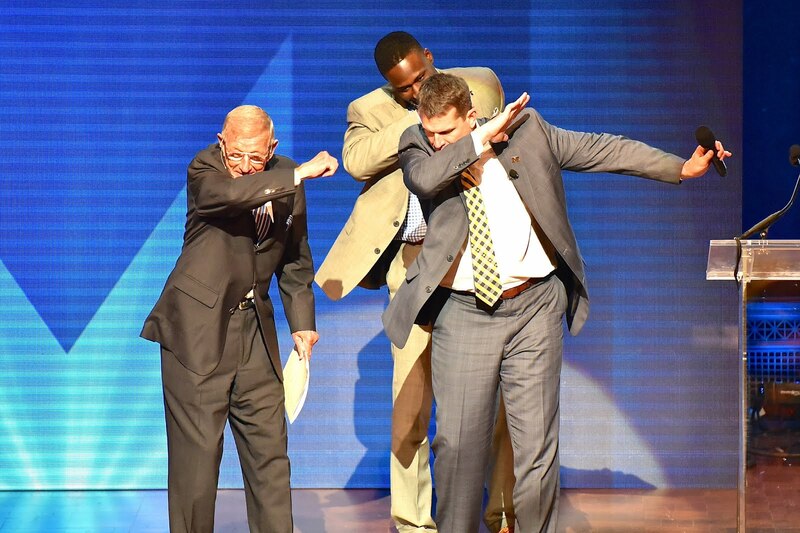 Clearly, they don't know what makes Jim Harbaugh tick. He lives for this. He didn't live for dealing with NFL-level egos and selfishness. The tagline "an enthusiasm unknown to mankind" has become a rallying cry of sorts for the Michigan football program. It represents what Jim Harbaugh is all about. He wants to win...at everything. And the only way to do that is to out-hustle everyone. But more than that, you need to out-think them, too. Jim Harbaugh goes one way while everyone else goes the other. He purposely stands out, not because he wants all of the attention, but because he just thinks differently. That was before the "Signing of the Stars" event that captured the college football world's interest on a day when everyone was trying to get attention. That video was made under the notion that Jim Harbaugh is many things. Among them...crazy, odd, quirky, cheesy, awkward, funny, interesting, wildly arrogant, surreal, genius, maniacal, endearing, polarizing. But above all else, he's genuine. His actions can come across as strange, but it's all rooted in righteousness. It's rooted in the knowledge that Jim Harbaugh has accumulated over a lifetime of competition on every level of football there is. All of this...yesterday's event, sleepovers, Ric Flair, climbing recruits trees, playing football shirtless with high school kids...everything he does is all for one simple thing. To win. Sure, he wants to win the right way, but to do that, you have to win first. Wins will come, they already sort of have. But what we do know is Jim Harbaugh is going to do things his way. It may seem strange, but his ability to make his strangeness both endearing to people on his side and infuriating to the people on the other side the likes of which we've never seen in Ann Arbor before, is still something we're getting used to. By the way, how great was Lou Holtz?! Granted, I needed subtitles to understand him a few times, but the guy brought it yesterday. That and Ric Flair's admission that he committed to Bump Elliott in 1968 was something I don't think anyone knew about. "Man, in this town you can stay all night and stay a little longer!" One day, yesterday's "Harbaughpalooza" will seem normal. Guaranteed, somebody will do something similar next year. Get used to it folks, this is the new normal. Who's got it better than us?